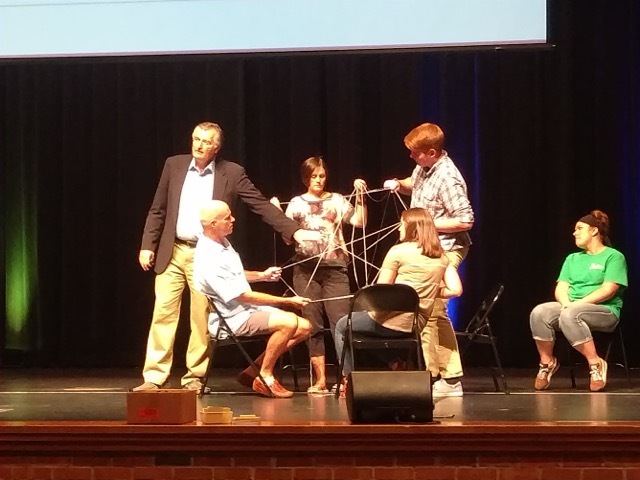 Peterson believes that creating a web of support for youth is a big factor, illustrating the concept by asking volunteers to act as anchors connected by crisscrossed strings to hold a balloon. “If you build the web of support the safety net takes care of itself,” Peterson said. Peterson said that youth with strong webs become more resilient to social challenges and thrive in overcoming adversity and helping others. He encouraged parents to see kids in a full spectrum of color versus the black and white of a good kid or bad kid. As an expert in the field of youth development, Peterson was sponsored by ZCS as part of the Strong in Every Way initiative.